Expert Opinion: Our society is moving at a faster pace than ever. With clients, co-workers, employees, family, and friends all demanding our attention — not to mention the incessant barrage of advertising, negative news, and social media — life can often feel overwhelming. Not only is stress damaging emotionally, it also wreaks havoc on our bodies. And an anxious nail tech makes for a tense salon atmosphere, which is the antithesis of what your clients are there to experience. > Recognize how you now deal with stress: Are you coping by using unhealthy behaviors such as smoking, drinking alcohol, or over- or under-eating? Are you making unhealthy choices because you feel overwhelmed? > Replace unhealthy coping behaviors with exercise, meditation, or talking with a friend. Be sure to take care of yourself by getting enough sleep, hydration, and good nutrition. Take regular breaks from work. You may have clients booked back-to-back, but taking even five minutes to stretch and walk around (preferably outside), will go a long way to reduce tension. > Reach out for help. Delegate some responsibilities and accept emotional support from friends and family. If you continue to feel overwhelmed, you may want to make an appointment with a therapist who can offer professional guidance in your managing stress. For me, I feel the most stress when I feel pressure — pressure from myself to do my best nail art, pressure if I’m running behind on a client, pressure when I feel micromanaged by anyone. I’ve learned to turn that around by first accepting the situation; it can’t be changed. The only part that can be changed is my reaction to it. So I breathe, collect my thoughts, and push through. Getting outside for a change of environment even just for 10 minutes can significantly change my stress levels. My next way of dealing with stress is to talk about it with someone — chances are another person can make you see a positive hidden among all the negatives. I also use an all-natural stress reliever called Bach Rescue Remedy. It calms your anxiety and stress to a manageable level and allows you to relax. If all else fails, a hot bath after work with some bath balms and candles, a glass of red wine, and a good book can do the trick, too. Usually my first reaction to a stressful situation would be to get mad and frustrated or just want to run away. Now the first thing I do is take a deep breath and pray. My boss has the best saying that I really try to live by: “If it’s not going to be a problem a year from now, don’t let it be a problem today.” Sometimes just smiling and walking away is the best option! 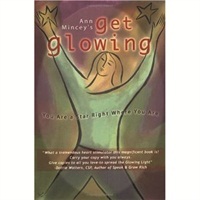 Anne VanSpronsen, McIntyre’s Salon and Day Spa, , Portage, Mich.
Get Glowing: You Are a Star Right Where You Are by Ann Mincey, vice president of global communications for Redken 5th Avenue, focuses on living a balanced, stress-free lifestyle and offers inspiration and tools for improving overall health, wellness, and relationships in both business and personal life.